A family of proofreading solutions for web applications. Have spell- and grammar checking up and running in your app in under 30 minutes. Get truly global with 16 languages covered by default and 152 additionally available. The language changes every minute. We make sure to keep your spelling up-to-date with regular dictionary updates. We love when our clients enjoy our products. So we take every client’s need as our own. Enterprise-class spell and grammar checking engine. Have licensing and pricing specifically tailored for your infrastructure and processing needs. Have our tech team fine-tune the proofreading to your company’s unique needs. Not a word is leaving your own servers. Seamlessly integrate the proofreading engine into your data infrastructure. 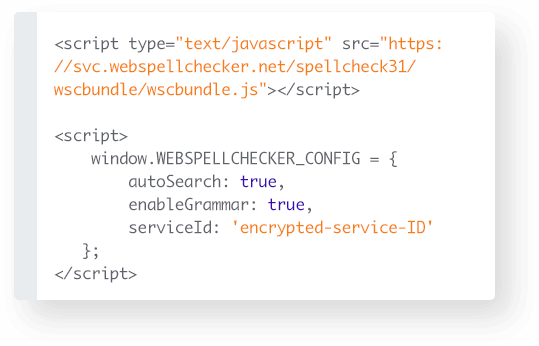 The Standalone version of the WebSpellChecker application can be configured and run on one of the following environments which can help you to reliably use our products. Perfect for startups, small companies, and projects with flexible scaling needs. Setting spell and grammar checking in your application is as fast and easy as copy and paste. The latest version of the spell and grammar checker is instantly available in your application with every update. Enjoy pure functionality, while we take care of all the maintenance. Varying in proofreading techniques all of our products have the same powerful WebSpellChecker proofreading engine at hearts. Find the perfect match for your application’s workflow. The ultimate proofreading tool. 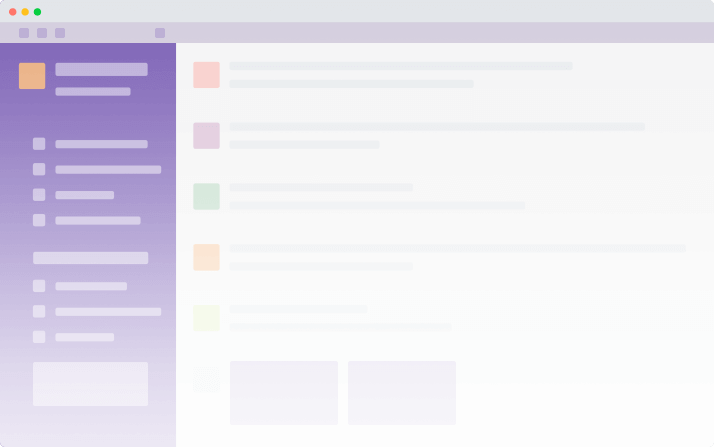 Provide both instant and on-click proofreading modes in a new beautiful UI. Integrate anywhere with a single script. Instantly underline spelling and grammar mistakes, while the user is typing. Provide correction suggestions for marked fords on hover. Ensure distraction-free proofreading, checking the whole text’s spelling and grammar on-click in a separate pop-up window. Build the proofreading tool up to your app’s specific needs. 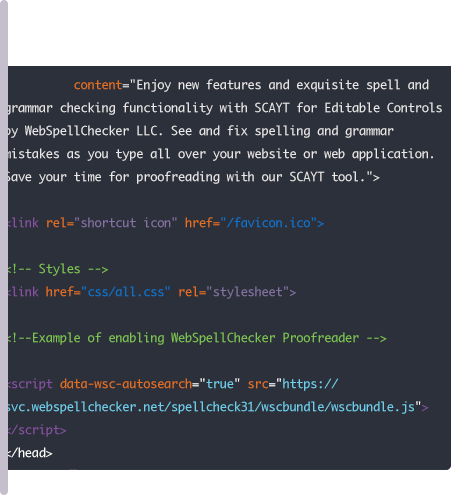 A set of spell- and grammar checking commands, and additional parameters provide you with the access to all the power of the WebSpellChecker engine. Effortless typo correction where communication speed matters. Receive spelling suggestions before sending messages to your co-workers. Ever wished for a second pair of eyes on your text before posting? Enable instant proofreading in the post editor for polished content on your WordPress resources. All of our products can be also purchased via our trusted software procurement partners. Feel like your customers need spell- and grammar checking solutions? Contact us for information about our Reseller Program.